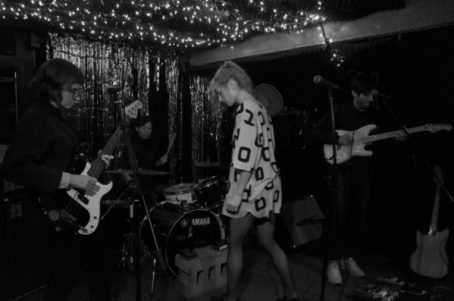 The sound of NYC's outfit Wall (featuring members already active in like-minded local groups Finally Punk, Keepsies, and Fergus&Geronimo) recaptures the early days of post punk, the first rock'n'roll movement openly promoting DIY as a creative choice - and a superior one for that matter. Those were the years when The Velvet Underground's droney, bony records with Reed's maudit lyrics were rediscovered, and many young artists radicalized that sound by stripping it of any melodic aspirations. This is pretty much what Wall does in their self titled debut EP, with their semi-atonal defying vocals, bare bone instrumentation, and DIY sounding recordings. Of the three songs currently available, our favorite is "Milk" (streaming below), which reminds us of the best early Sonic Youth tracks, slowly building through a combination of Vanessa Gomez's evocative tense vocals, the subtly evolving guitar chords and the varying speeds of the rhythm section. Check out also their most popular, more aggressively punk single "Fit the Part." The band will be celebrating the EP's release at Union Pool on January 15, you can preorder it here. We added this song to The Deli's playlist of Best punk/garage/DIY songs by emerging NYC artists - check it out!